There’s a striking mural depicting the facets and faces of the Black Panther movement on the corner of Jefferson Boulevard and 11th Avenue titled “To Protect And Serve” that I’ve found very revelatory ever since I first discovered it back about 10 years ago. It was painted in 1995 by Noni Olabisi, and the story of how it almost never was until the community and the Social and Public Art Resource Center (SPARC) rallied against opposition to it from civic leaders is compelling in its own right. In the 22 years since its installation, it has proven to be as polarizing a work of art as the movement, enduring various defacements and damage. About six months ago I was pleased in passing to find it being restored. The dramatic color scheme, long faded from years standing against the afternoon sun, was brought back to gloriously eye-popping vibrancy. But there was little time to celebrate its renewal. Seemingly only days after work had been completed I drove by and found the center of the mural caved in. The heartbreaking indentation looked to be about as wide and as high as a bumper, so my assumption was a vehicle involved. The question was, given the indignities this mural has endured over its years, was its ramming accidental or intentional? Passing by a few days later I saw the letters “KKK” had been added near the crushed section. The damage stood until a couple months ago, when repairs were made to the wall, leaving a large replastered area. I figured fixing the wall was inevitable, but not so clearly a given was if the mural would be. Then came Tuesday afternoon and on my way home from work I saw Olabisi, brush in hand and filling in that void. I thought about turning around and coming back to meet her, but I was lazytired and so I didn’t. Yesterday afternoon, same story, but different ending; this time after seeing her I yanked a right at the next street and came back up 11th Avenue where I found her in conversation with a fellow named Victor. I stepped right up and told her how thrilled I was to see the mural being re-completed. She bemoaned the fact that in the time between Tuesday evening and now someone had already marred it. She pointed out the word “Apache” had been tagged onto the sleeve of one of the officers depicted subduing Bobby Seale whose face had been covered in black spray paint. We all stood there shaking our heads. The three of us eased into a wide-ranging discussion on race, art, history, politics, the Rwanda genocide, the First Amendment, the Second Amendment, basic human goodness and instincts, Tupac, Jimi, Daryl Gates, and how love and respect is the answer to combating evil. 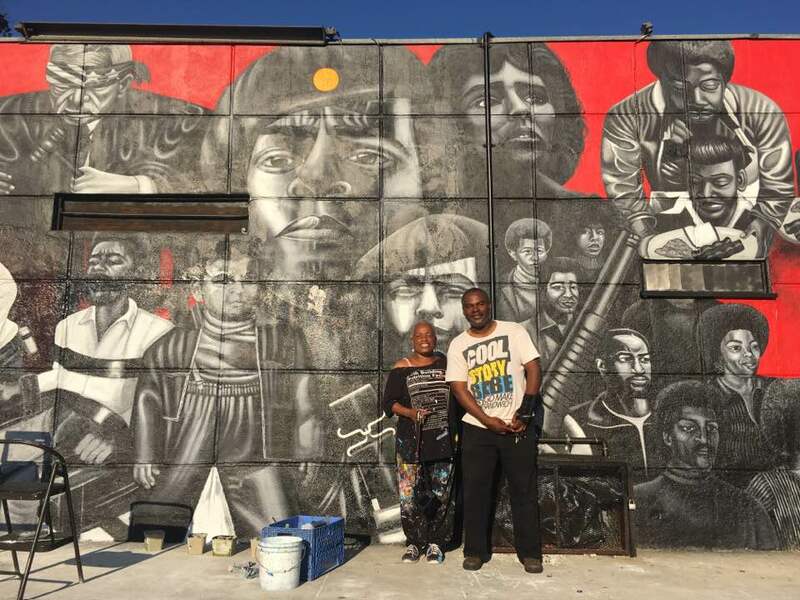 I asked her about the significance of the bright circle on the beret near the top center of the mural (visible in the picture above with Olabisi on the left and Victor on the right), and she told me it represented the sun which shines upon us all equally and without discrimination. Amen, sister. Before I gave Olabisi a hug goodbye, I was emphasizing my continuing belief — despite ample evidence to the contrary — in the basic goodness of us as individuals and as a species. A young lady, showed up to take some pictures of the mural and as she passed us Olabisi was talking to me about Hendrix and trying to remember a statement attributed to him. “When the power of love… is greater,” she started, but couldn’t remember the rest, and I couldn’t either. This entry was posted on Thursday, July 13th, 2017 at 6:23 am and is filed under art, encounters. You can follow any responses to this entry through the RSS 2.0 feed. Both comments and pings are currently closed.